At City Centre Health Edmonton Chiropractic we love when our patients share their feedback and comments with us about the care they received at our clinic. Please read our patient testimonials below to see what other people have achieved through their tailored treatment plans with us. Click here to send us your feedback so that we can help to spread the word about the benefits of our all-natural care. Amazing staff, very professional and friendly. Dr. Niz is by far one of the best chiropractors I have ever had the pleasure of dealing with! Genuinely seemed to care and want to assist. I really appreciated everything that Dr. Niz explained. Never heard any chiropractor tell me these things before and show me what was wrong with my posture. I began a regular treatment program for my back and laser therapy on my foot after recovering from a fracture. I noticed a significant change immediately. I have been receiving regular treatments from Dr. Niz and I am now down to one appointment a week. Dr. Niz has even shown me some proper technique when doing my exercise routine which help with my shoulder issue. I can’t say enough good things about Dr. Niz and his staff. I would highly recommend Dr. Niz. Dr. Niz and the whole team have been nothing but spectacular since my first visit. 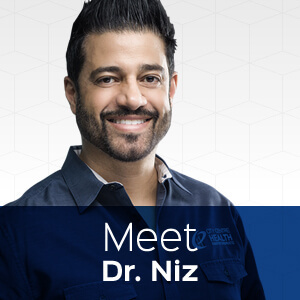 From day one, Dr. Niz identified my issues, causes for discomfort, and has continually provided guidance towards my long term goal of alleviating hip/back pain. I am highly impressed that everything was explained to me in detail. I am very impressed with the knowledge and overall experience! I am impressed with the knowledge and efficiency of Dr Niz and the staff and would not hesitate to refer any of my friends to the Clinic. I have been seeing Dr. Nizar Saab for a month now, and I can say that my back has never been better! Dr Niz was excellent in explaining everything. I like that he wants to solve the issues that cause me pain. I feel that I am on the right road to recovery of being pain free. Thank You! Very cool and straight forward! Very knowledgeable, professional and attentive. Very impressed by the whole process and of course the great Dr. and staff. Looking forward to my next visit and thereafter. Dr Niz and his staff are awesome. I feel so much better after one treatment, look forward to a better alignment and flexibility. Very nice place! Good folks who listen to the patient’s issues and concerns. Dr. Saab is a breath of fresh air! I gleaned a new energy which has assisted me with renewed motivation to work towards a wholesome healing. Incredible experience. Helpful, kind, knowledgeable staff. Definitely returning to this clinic. Keep up the good work! I experienced a sudden loss of movement in my left arm which left me in a great amount of pain and unable to move my arm. I contacted Dr. Niz, who performed an assessment and put me on a laser treatment plan. My condition improved dramatically, and I am now able to move my arm and work again! Seeing Dr. Niz was a blessing for me, and I really encourage everyone to seek his advice, it really works, and his staff is amazing! Very impressed on just my first visit and I look forward to the benefits I believe Dr Niz will bring to my overall well being. Enjoyed the 1st visit and liked the overall approach/philosophy. Looking forward to get healthy and back on track. So glad to find this place .. very hopeful days ahead. I met Dr. Niz outside the clinic and although he didn’t solicit that I visit the clinic, I really found his information useful and he was open with it that I asked him if I could work with him to recover from an injury that probably occurred due to being out of alignment. I am of this belief as well, albeit not nearly as knowledgeable about body alignment. I am feeling excited and hopeful about my recovery. Thanks, Niz! So helpful and absolutely what I’ve been looking for in the way of LONGTERM health, not just a quick fix. I was very hesitant to see a chiropractor but my injuries had finally built up enough that I had to do something. Dr. Niz was extremely helpful and attentive to all of my concerns. I left feeling better than I have in a decade. I would highly recommend visiting Dr. Niz and at least giving him a chance. You won’t regret it. I went in expecting the worst and after my first adjustment my shoulder felt better immediately and has been great for the past few days after the visit. I’m very hopeful in my recovery. All staff interaction were fantastic. I’ve been dealing with forearm and wrist pain for over 3 years. I had been to countless doctors, physios etc. and all of them only treated the symptoms, prescribing me pain killers and nerve blockers. None of them looked passed my pain to figure out where it was coming from. In just a few appointments with Dr. Niz I have made more progress in a few weeks then I had in years. It’s not hard to see why, he takes more time in his assessment of you then anyone before and he doesn’t fall into complacency and treats you each time like it’s your first time. For the first time in years, I have hope that I will be able to over come my injury and live pain free. I highly recommend City Centre Health Edmonton Chiropractic to all friends, family, and anyone struggling with pain. I have been with this office since I was 4, I have seen 3 chiropractors in that time and Dr. Niz is by far the best Dr I have had so far in my life. He is very kind and smart also. Absolutely wonderful environment, the staff was very informative, understanding and friendly. I really appreciate how passionate Dr. Niz is about helping others. Thank you! Outstanding staff. I am so pleased that at long last we are not treating the symptom but rather the root of the problem. Dr. Noz listened and targeted my issues right off the bat. Share your own story! Give City Centre Health Edmonton Chiropractic a call today.